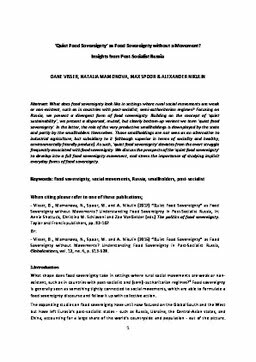 What does food sovereignty look like in settings where rural social movements are weak or non-existent, such as in countries with post-socialist, semi-authoritarian regimes? Focusing on Russia, we present a divergent form of food sovereignty. Building on the concept of ‘quiet sustainability’, we present a dispersed, muted, but clearly bottom-up variant we term ‘quiet food sovereignty’. In the latter, the role of the very productive smallholdings is downplayed by the state and partly by the smallholders themselves. Those smallholdings are not seen as an alternative to industrial agriculture, but subsidiary to it (although superior in terms of sociality and healthy, environmentally friendly produce). As such, ‘quiet food sovereignty’ deviates from the overt struggle frequently associated with food sovereignty. We discuss the prospects of the ‘quiet food sovereignty’ to develop into a full food sovereignty movement, and stress the importance of studying implicit everyday forms of food sovereignty.